Home / QuiBidder of the Week – Carrie G.
Congrats to Carrie G., the new QuiBidder of the Week! You may recognize Carrie from sharing this photo on Facebook last week, which she earned QuiBidder Points for posting. Go here to learn more about earning QuiBidder Points for following QuiBids on Facebook. 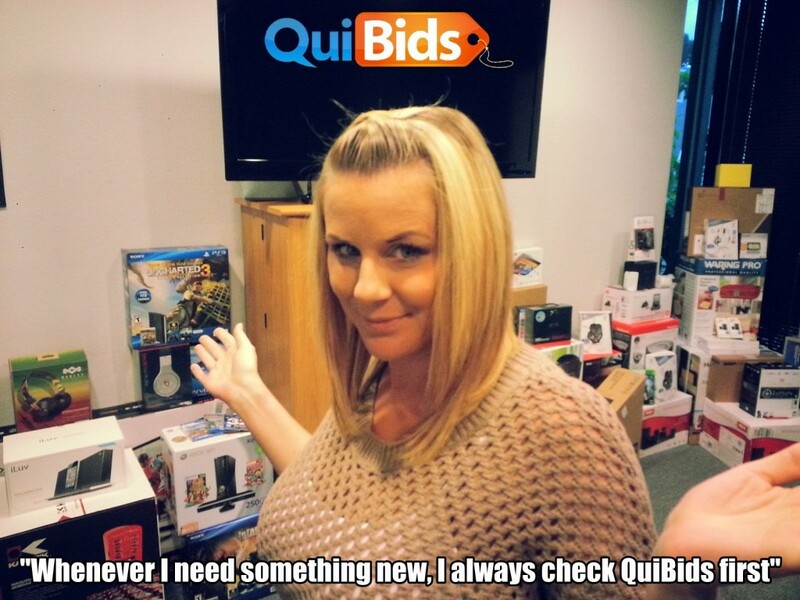 If you want to be a QuiBidder of the Week like Carrie, be sure to tell us your QuiBids story here. To qualify, you must submit a picture of yourself with your wins, similar to Carrie’s photo below. If we choose your story/photo, you’ll receive a $50 gift card of your choice! Continue reading to learn more about Carrie’s experiences on QuiBids. Tell us about your best QuiBids win. Have you ever given your QuiBids win as a gift for someone else? What’s the most Voucher Bids you’ve ever won from a QuiBids Gameplay?